Different options from budget, medium and all the way to top end hotels. In the form section below "any other information" please provide some indication of your preference. Some options are on the beach road while others are close by, off the beach road. all females interested in booking will need to reserve your details to get priority to book when we have more men. we can accept your booking today. we can accept a joint booking, always subject to availability. These days, you have to be quick off the mark if you want to get the accommodation you want at dance weekenders. Most of our requests come from females wanting to book a place in our Female Rooms. Others come when we have sold out on options. This weekender can sell out very quickly, but things do happen where people have to cancel or move rooms etc, so we run a Reserve List to see if we can give people what they want. The Trouville Hotel has bedrooms for 160 people, while the dance hall capacity for 2018 is 250. This remaining numbers is for either Isle of Wight residents or we over flow to next doors hotel. 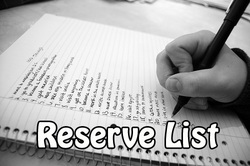 Please be on the Reserve List. This shows us your commitment of wishing to attend this weekend. So, if you want to put yourself on our Reserve list, then please complete the form below and we'll get back to you asap. Thank you.